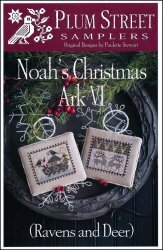 Noah's Christmas Ark 6 [D6006] - $10.00 : Yarn Tree, Your wholesale source for cross stitch supplies. Cross stitch pattern from Plum Street Samplers. Christmas is going to be celebrated on Noah's Ark this year! Santa is aboard with two ravens, one on his hand & one on top of the ark with some Christmas berries in his beak. Don't worry about a Christmas tree, Santa has it covered! Snow is beginning to fall as they travel through the waters. The second design features two reindeer walking in the snow covered ground with beautiful pine trees in the distance. These two designs will make a beautiful addition to your Christmas tree! Stitched on #2239 R&R Reproductions 36ct. Patriot's Brew. Stitch count 58w x 48h. Should you choose to stitch all 12 blocks in this series on one piece of linen, your stitch count will be 244W x 152H.